The second you get your baby in the car for the very first time. There is nothing more lonely than being a mom of a baby in the NICU. Our Son was featured on CNN today enabling us to share our story with the world! 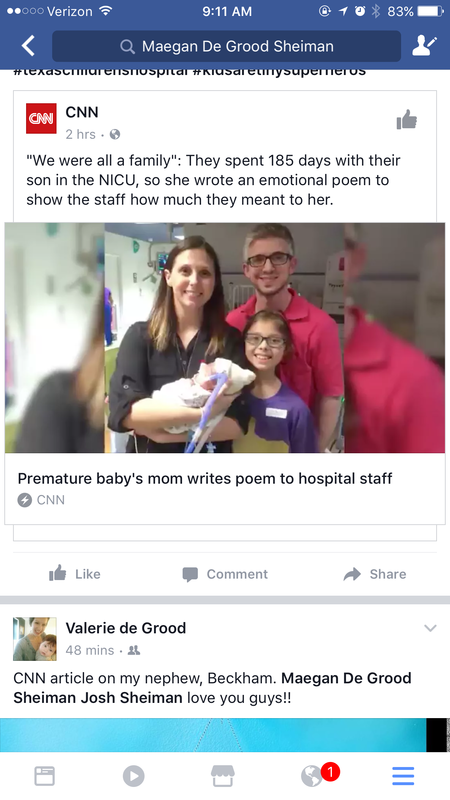 We are over the moon to share is story of thanks for the NICU staff and everyone who has helped us and also as awareness for premature birth! So I’m going to interrupt the telling of my sons story to share something that I have written for my son and everyone that worked with him in the NICU and out of the NICU over the past year. It’s hard believe he is here and he has reached the age of 1 (8 1/2 months adjusted). It’s a long poem but his story has not been short and every bit of it has gotten him here to this day. Happy Birthday little man and thank you to everyone that has helped us get to this point! After the dust had settled from the day of Beckham’s birth reality began to sit in. We started reading up vigorously about micro preemies, percentages, what to expect, other peoples stories and more. Regardless of the percentages as I read other moms stories of their micro preemies I began to feel a bit of relief and maybe even an ounce of hope. Stories of people that we knew flooded in. People that were preemies, or knew someone with a preemie that had survived and was doing fine. All of this time we didn’t know any of these stories about our friends or their friends and relatives and now we were learning so much about them. The hospital had a library where I found a few books on prematurity and what to expect as well as real stories from the NICU. As we read through these stories we found the majority of them the babies had 1 or 2 issues and then were fine. It was reassuring and I hoped this would be the case for us. In the NICU there is no future, there is only present. It’s important for parents to adjust to this mindset of not being able to plan for their baby’s milestones or going home date because it will only lead to more and more disappointment. Easier said than done. As a project manager this was one of the toughest adjustments for me being in the NICU. I am a person that likes complete organization, to have things planned out and if anything changes all hell breaks loose. How can I not think about my baby’s future? Honestly, a tough adjustment mentally but emotionally it was easy. If I began to think about what the future held for my baby I would just start crying, so essentially it required me to create a mental block and focus on the now. Staring down at a human, the size of a trinket statue you would see inside someones hutch, it’s hard to imagine it surviving. He had a full head of hair and was completely proportional. Many of the nurses commented on how good he looked as most babies at 24 weeks look like “alien babies”. He was very pink and his skin was so thin you could almost see through it. There was not an ounce of fat on him. Pure skin and bone. We could see his full rib cage and all. The doctor placed an ointment over the baby’s eyes and just as I was about to ask why he hadn’t opened his eyes yet the doctor read my mind and explained that since the baby is 24 weeks old his eye lids are still fused together and he cannot open his eyes for another week or so.